Funn av boreale furustammer fra Oddernes i Vest-Agder. Påvisning av Tapes-transgresjonen. - Boreal pine trunks from Oddernes (Vest-Agder, Norway). Demonstration of the Tapes-trasgression. A number of sub-fossil pine trunks were found about 3 m below surface at Oddernes School, just north of Kristiansand, in the southernmost coastal part of Norway (Fig. 1). The stems were embedded in the lowermost part of a c. 1.2 m thick layer of highly humified peat and were extraordinarily well preserved. The peat was overlain by a c. 2.15 m thick layer of clay mud, which contained marine indicators: Ruppia, "Hystrix" and Discorbina. No marine indicators were recognized in the compact sand layer below the peat. The trend of pollen curves is very characteristic. Therefore, the diagram from Oddernes could easily be zoned in accordance with my two other diagrams from this district, viz. Fluetjern in Oddernes and Cladiumtjern in Søgne (Rafsten 1956, Pl. 16). The sudden immigration of alder and the first advance of mixed oak-forest indicates the zone border V-VI (Boreal/Atlantic) at about 2.15 m below surface. The high NAP-percentages in zone V is due to the local vegetation on the bog surface. NAP disappears when the bog complex was flooded by the sea (by the Tapes transgression) at the end of Boreal time. The boundary between Zones VI and VII has been fixed at c. 1.35 m, at the level of immigration of lime and the considerable advance of oak. Because of the decrease of elm, the zone-border VII-VIII (between Atlantic and SubBoreal time) has tentatively been defined at c. 0.15 m below surface. The relatively frequent occurrence of pollen of Hedera, Viscum and spores of Osmunda from 1.60 m below surface to the top confirms that this part of the diagram really corresponds with the post-glacial warmth period. The finding of another four pollen grains of Ephedra distachya type from this region (cp. the AP-diagram) is of special palaeobotanical significance, as these pollen grains, particularly the two uppermost ones, date from a period when the mixed oak-forest grew rather densely in this region. Since 1956, when I published the first records of subfossil Ephedra pollen grains from Norway, a number of new finds have been made, and now it cannot be questioned that this strange shrub really was a constituent of the late-glacial and also of the early postglacial vegetation of southern Norway. 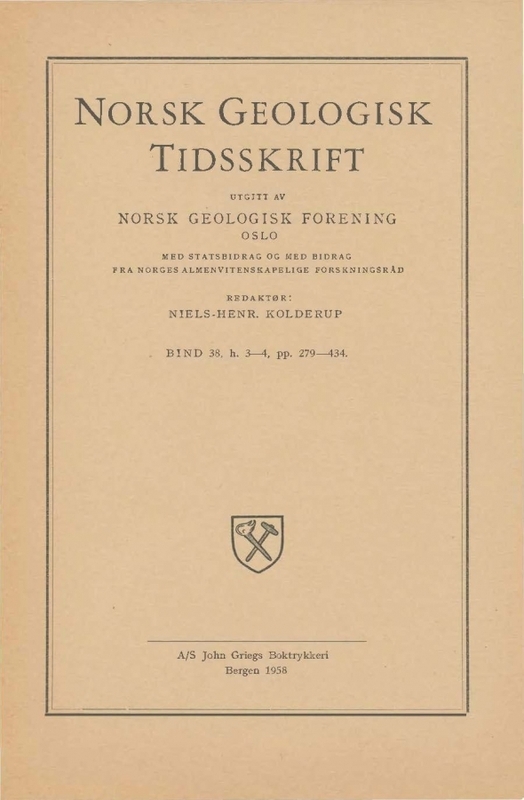 The dry hills, as well as the precipices of the uneven area just north of the plains and terraces of Kristiansand and the southernmost part of Oddernes (e. g. Preståsen) undoubtedly provided useful refuges for heliophilous and xerophilous plants like Ephedra, even in Atlantic time, when the mixed oak-forest grew densely enough between the hills and the cliffs. Since the boundary between Zones V and VI is very sharp and well-defined, the pine stems can with a great degree of reliability be dated to the Boreal period, and most pro ba bly to the first part of it, i. e. nearly 9 000 years ago. The characteristic stratigraphical sequence, a thick clay mud layer deposited on top of the terrestric peat layer, as well as the interchange between freshwater indicators (Potamogeton, Menyanthes and Pediastrum) on one side and marine indicators (Ruppia, Hystrix and Discorbina) and sea-shore plants (Elymus arenarius, Plantago maritima and pollen of Chenopodiaceae) on the other, depicts a typical transgression phase. According to the zonation of the diagram there can be no doubt that this phase refers to the Tapes-transgression, which is known from a series of southern and southwestern coast stations situated on the outskirts of the last glaciation. The thickness of the clay mud layer shows that this transgression must have been at least 2 m at this place and that the shore-line before that time la y below c. 7.35 m.